Stefan Marinoiu is not a federal or provincial political figure, or an entertainment celebrity of any kind talking endlessly about raising autism awareness without taking any action to help the 1 in 88 Canadians who suffer from autism disorders. Stefan is a real Canadian autism hero. He has made courageous efforts to have our federal government address Canada's autism crisis. Stefan has raised autism awareness without the benefit of political or media connections. He has not done so in order to obtain free travel to Banff or the UN or to augment a political career, he has done it to help his son, Simon, and others with autism disorders. He has done it by twice putting his life at risk with a mid winter walk :autism" trek from Toronto to Ottawa and with a hunger strike. I was very pleased to meet Stefan and his wonderful family in Toronto. Stefan did not confine his efforts to simply raising the awareness as happens with so many much less challenging efforts. Stefan actually advocated for our federal government to get involved in a meaningful serious way to address Canada's autism crisis. Unfortunately the Stephen Harper-Mike Lake government does not want to acknowledge or deal with Canada's autism crisis and there will be no federal progress in Canada as long as the Harper version of the Conservative government holds majority control. Not a single member of our Harper Conservative government, not even those with family members affected by autism, have bothered to push for meaningful federal efforts to address Canada's autism crisis. I doubt though that Stefan will give up. I will try to follow Stefan's example and continue efforts to advocate for meaningful efforts by our federal government to address Canada's autism crisis. Those of us who believe that our federal government should offer meaningful assistance to the 1 in 88 Canadians with an autism disorder have to look past the Harper era and look to NDP and/or Liberal governments to address Canada's national autism crisis. We can't give up in the face of Harper's indifference, we must keep fighting and refuse to give up. Conor, anxious to get to Leo Hayes High School, to the resource center with other challenged kids for socialization, and to his individual learning area for his ABA based instruction, watches the clock this morning. Conor votes YES for flexible inclusion with meaningful access to learning. Minutes before departure Conor, on his own initiative, brings Dad his sneakers to make sure I don't forget to drive him to school on time. 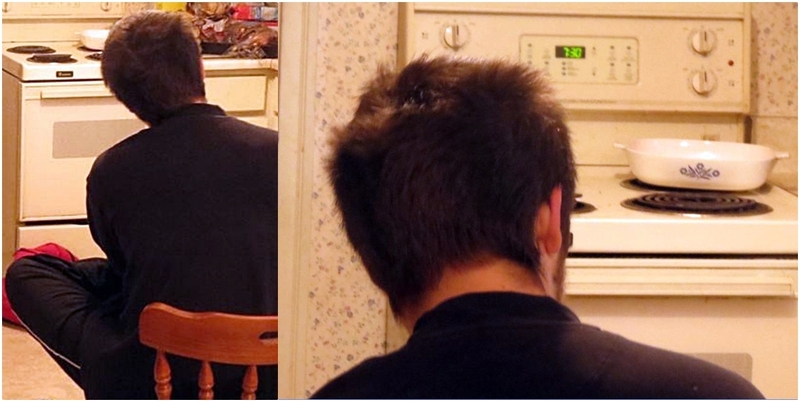 I am forwarding the above composite picture of my son Conor, seated in the kitchen watching the clock at 7:30 am this morning. 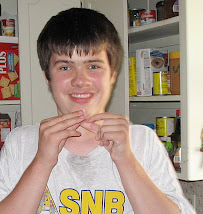 Conor, now 16 years old, has severe Autistic Disorder and is assessed with profound developmental delays. He was not placed on a "time out" chair for having behaved badly. He was sitting there of his own choice because he was, as he is every day, anxious to get to school at Leo Hayes High School, an experience he truly loves and one which he misses during the summer months. I encouraged Conor to engage in other activities instead of just sitting on the chair and he did so. At precisely 7:55 though Conor, again on his own initiative, brought me a pair of my sneakers and handed them to me, as a polite reminder to Dad to get ready to take him to school. To the far left of the picture is a red object. It is his school back pack including his lunch pack which he packs the night before and placed in the fridge. In the morning, on his own initiative, he places the lunch pack inside the back pack and places them near the exit door to ensure that it is with him when Dad drives him to school in the morning. With these actions Conor indicates clearly what a positive experience his flexible inclusive education at Leo Hayes HS is for him. Conor does not, at our request receive his instruction in a regular classroom. Some autistic children can prosper in a regular classroom and some, like Conor, require instruction outside the regular classroom in a quieter space where he is not overwhelmed by noise and other distractions. Conor started his schooling in a regular classroom and came home every day with self inflicted bite marks on his hands and wrists. (self injurious behavior is a recognized condition commonly associated with autism disorders). Once removed the biting ceased and Conor received his instruction in an individualized area in grade school, middle school and high school. His instruction has been provided by education assistants/teacher aides trained at the excellent UNB-CEL Autism Intervention Training program. Conor's socialization has NOT been impaired by these arrangements. Throughout school he has, in consultation with us, his parents, been involved in various outings and activities within his abilities including some specified gym activities, swimming (his favorite), outings like apple picking (another favorite) and last year he even attended a play put on at Fredericton's playhouse. Other students have ALWAYS greeted Conor warmly at every level of school. Some have even sought him out at our home in order to say hello to him outside of school. At Tim Horton restaurants Conor has been greeted by staff who are were students at school and knew him through Best Buddies. I underline these facts because it is important to realize that full regular mainstream inclusion is NOT necessary to ensure a full social learning experience for children with severe challenges like my son. One of the greatest socialization assets for Conor has been the Resource Center at the Leo Hayes High School. The RC is well staffed with trained experienced personnel that know how to manage children with extra needs in as stress free a manner as possible. It also provides a variety of tools and sharing of information directly by people who are actually working directly with challenged children. Stigmatization does not occur by placing challenged children in a resource center for parts of the day. Stigmatization and outright harm occurs by pretending that all children regardless of cognitive level and regardless of disability based sensory and behavioral challenges, must receive instruction in the same area as their chronological "peers". 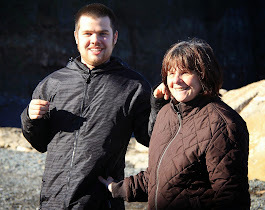 I have made these statements again on Conor's behalf, as I have made them throughout his education because of the constant threat posed to the flexible mode of inclusion that has benefited him in his education. The ideologically based every child in the regular classroom model to which this current administration and its most trusted advisers subscribe would be detrimental and harmful to my son if inflicted upon him, if his ABA based learning in an alternative area or if his socialization, security and happiness in the Leo Hayes High School are targeted for elimination. Conor demonstrates the success of the current flexible model of inclusion, of the ABA instruction he has received outside the regular classroom, of the security and opportunity for socialization that the Leo Hayes High School Resource Center provides. Please do not ignore Conor's story while making decisions affecting his future and the future of other children who need accommodation outside the regular classroom. I ask both of you Honourable Ministers to be faithful to the above definition of inclusive education fashioned after years of consultation conducted by Ministers of the Lord and Graham governments and examined the evidence of my son and other children with needs that require education outside the regular classroom. Please continue the option for individualized education outside the regular classroom for those like my son who require that arrangement. And please do not eliminate valuable, proven resources like the Leo Hayes High School Resource Center that have contributed so much in the way of socialization, security and friendship for my son and others with similar needs. 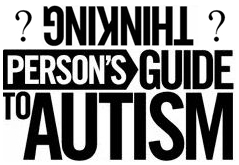 On Twitter in the past 24 hours the questionably named Thinking Persons Guide to Autism does what it often does: distributing unproven, non evidence based, opinions as representing all there is to know about autism. RT ..... Autistic meltdowns are panic attacks, not tantrums. Pass it on. 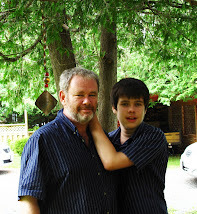 http://tmblr.co/ZufSAyU29DkK #autism"
My 16 year old son is severely autistic. He is also assessed with profound developmental delays. His meltdown behaviors are complex at any time. His meltdowns are not all triggered by the same events. Some appear to be frustration based in terms of the inability to do ... or to stop doing something when he obsesses with something like a Little Einstein video. Some times his meltdowns appear to be triggered by internal physical discomfort of various sorts. 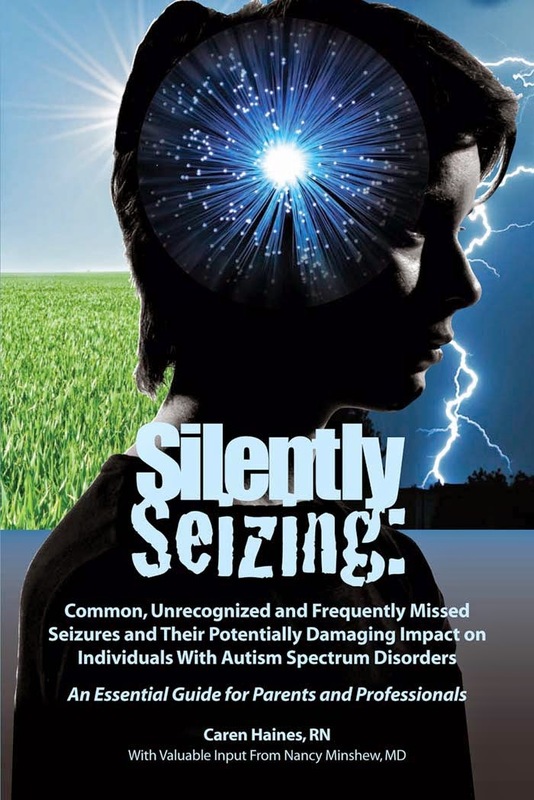 Some times they appear to be related to seizure activity. 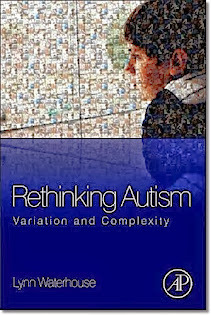 I am talking at this point only about my own severely autistic son not about other persons with autism disorders whether they be severely autistic with limited communication skills or whether they are High Functioning Neurodiversity activists promoting their perception of their autism condition as the universal reality for all persons with autism disorders. I can not, and do not, say that ALL persons with autism disorders experience meltdowns in the same way or for the same reasons as my son. What I do say is that the person involved with the original tweet and the Thinking Persons Guide To Autism can not say that my son's meltdowns are always panic attacks. My son's complex meltdown behaviors are just not that simple..... pass THAT on please! This autism dad asks New Brunswickers with autism, or autistic children or family members or friends, professionals working with autistic children and adults or people who just plain care to register Liberal today and vote for Mike Murphy as the next leader of the New Brunswick Liberal Party. I do so because I believe registering with the Liberal Party and voting for Mike Murphy for leader offers the best hope for rebuilding NB's autism services system currently being dismantled by the Alward government. Why am I asking you to register and vote for Mike Murphy? Because I believe he is the best hope for a better life for New Brunswick children and adults with autism disorders. In making this statement I am well aware that both of NB's "government forming parties" have initiated change for the betterment of autistic children and students although neither have made positive steps toward helping autistic adults. Positive changes for NB'ers autistic population started with Conservative Premier Bernard Lord and continued with Liberal Premier Shawn Graham. I have publicly thanked and acknowledged their contributions in the past and do so again. But that was then and since the Alward government came to power, as expected, and as I predicted, much of that progress is being rolled back. Specifically the world class autism training provided by the UNB-CEL Autism Intervention Training program to early intervention workers and education aides working with autistic children has been discontinued. A theoretical in-house training plan has been developed which is a rehash of old plans submitted by Education department bureaucrats and rejected as lacking quality and integrity by the Autism Society New Brunswick. Specifically there are no meaningful criteria for admission to the "in house" training, no significant testing or course completion requirements. The in house training results will also be subject to challenge by the union representing aides and could become enmeshed in the grievance process. From the department's perspective though the "in house" system is cheap. That is why the department discontinued the UNB-CEL Autism program that provided quality and integrity for training autism aides and early intervention workers. Education aides who already received UNB-CEL autism training and who have been working with autistic children are actually being replaced in some cases by aides with no autism training. Alternative learning arrangements outside the mainstream classroom to accommodate severely autistic children are also being eliminated under the Alward government. In particular, resource centres existing in some schools which provide an excellent service to severely autistic children and other children with serious challenges are targeted for elimination. 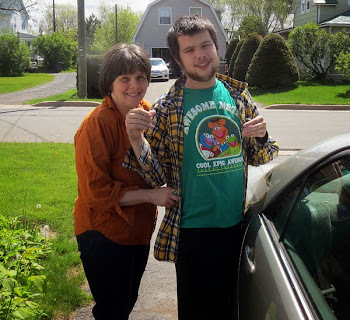 As with all previous governments no progress has been made towards a modern residential care system for NB adults with serious autism challenges. Such a proposal will not see the light of day in an Alward government which pats itself on the back for its inclusion practices while ignoring the plight of those with severe autism disorders living in psychiatric and general hospitals for lack of a modern autism residential care system as proposed by NB autism expert Paul McDonnell, Ph.D., psychology and clincial psychologist. 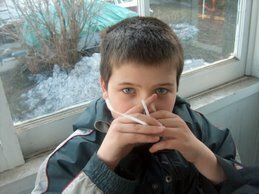 If future autism progress is to be made in NB it will not be made under an Alward government. The alternative, at this time is the Liberal Party. The NDP may become a factor some day and perhaps before the next provincial election but to date NB'ers have had only 2 choices in electing a government Conservative or Liberal. With the Liberal Leadership race on the choice of Liberal leader will have a huge impact on whether autism services have a chance of being restored. There are nominally 3 candidates running for leadership of the Liberal Party. Of the three any discussion I have heard, with no offence intended toward Nick Duivenvoorden, indicates that the race is between Brian Gallant and Mike Murphy. I sat front row centre at the first public forum of the 3 Liberal candidates in Fredericton. I was very impressed by Nick Duivenvoorden's personal qualities, especially his great sense of humor but I didn't hear a lot of specifics on policy issues. Nor did I hear any specifics on policy issues from Brian Gallant. The only candidate who did provide detailed specifics was Mike Murhpy. That said: None of the three candidates provided any commentary at that session or since on "autism" issues. Brian Gallant seems like an outstanding young man and a person with obviously unlimited potential in politics. But I do not see generally, and specifically with respect to autism, any reason to support him at this time. I know he has powerful supporters like Dominic LeBlanc who left a robocall voice mail message on my home phone but powerful supporters, an allegedly new approach to politics, and a background in corporate law do not provide me with any sense that Brian Gallant will have anything to offer to improve services for the 1 in 88 NB'ers with autism disorders. Given that none of the candidates have provided an autism specific policy statement why would I endorse Mike Murphy, as I do, without reservation? One reason, but it is not the major reason, is that I have known Mike Murphy since day 1 of law school. I knew Mike as a friend than and after law school when we both worked at the same law firm in Moncton. I know with certainty that Mike Murphy has, throughout the time that I have known him, helped people as an individual and has done so without seeking credit or recognition for doing so. I am asking specifically though that NB'ers with an autism interest register TODAY with the Liberal Party and support Mike Murphy and the major reason I am doing so is that I know, as an autism advocate over the past 12 years in NB that Mike Murphy stood with us back when NB's autism advocacy movement was going through a very active beginning phase. I know and I could say so under oath that Mike literally joined in our autism advocacy efforts. As one specific example he assisted us in advocating for better treatment and care of an autistic man who was living at Centracare in Saint John. More generally I have been able to engage Mike in discussion on autism issues and the importance of evidence based approaches to autism care at any time that I sought to do so. And let me assure you of one thing, Mike understands autism issues. I am not trying to push anyone to act against their political leanings. I am not asking you to vote for Mike based solely on our personal friendship. Anyone who knows me, including Mike, knows that I would throw him under the bus in a heart beat if it would result in better autism services in NB. 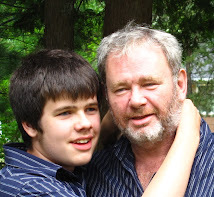 I am simply explaining why I, as an autism dad and autism advocate, believe the best thing we can do in NB at this time to rebuild and improve services for autistic children and adults is to register Liberal and vote for Mike Murphy. If you agree please register online TODAY and vote for Mike. If you agree please encourage anyone you know with an autism interest to register Liberal TODAY and vote for Mike Murphy. Where will our 16 year old son with severe autistic disorder and profound developmental delays live as we grow older and eventually die? That is the biggest question I face, the question that I have to keep out of my thoughts each day, as we try, as best we can, to help our son enjoy life while he is with us and in order to help him prepare, again as best we can, for the future. 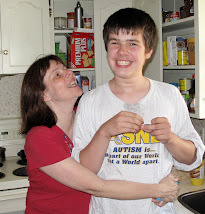 For me, the story of autistic 19 year old Toronto area teen Miles Kirsh told by Toronto Star Social Justice Reporter Laurie Monsebraaten in the article Frantic parents search for housing for severely autistic son is a story I understand very well. 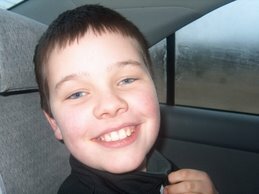 "Miles was diagnosed with autism at age 2. His parents largely cared for him on their own until adolescence hit and the family could no longer manage the growing boy’s often self-injurious behaviour and insomnia. 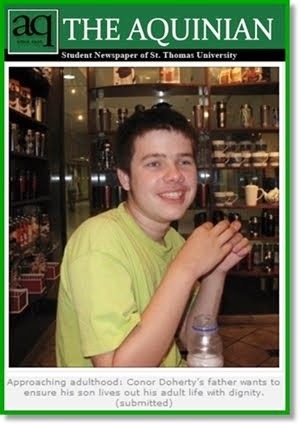 Just after Miles turned 16, Kirsh asked the network to find residential care for him. When he was a teenager, she drove Miles from the family’s Thornhill home every day to another specialized school at Yonge and Eglinton. But Miles’ dangerous behaviour in the car to and from school —banging against the window and grabbing the steering wheel — combined with mounting family expenses and his tendency to wander unattended, prompted Kirsh to reach out." Our son Conor has, at times, engaged in almost identical behaviour to Miles Kirsh as reported in the Star. Our focus, to date, has not been on moving Conor out of our home. He has been a great joy for us notwithstanding the challenges he presents and I would guess the same to be true for Miles parents notwithstanding their separation from the stress of the severe autism challenges of their son. The Star goes on to report the desperate need, in Toronto and across Ontario, for housing care for autistic adults. The Star could have easily added "and in New Brunswick" and it would have been very accurate.I have, both as an Autism Society New Brunswick representative and individually as Conor's dad, advocated over the past decade, without any measure of success, for the establishment of a severe autism adult care facility here in Fredericton near our autism expertise at UNB and at the Stan Cassidy Centre. We have a general group home system that lacks the ability to provide care for severely autistic adults who are left to reside in psychiatric hospital facilities. The lack of government responsiveness to the need for adult autism facilities can be attributed generally to the financial challenges governments face. Here in New Brunswick though we face another obstacle, a non-elected unofficial branch of government, the New Brunswick Association for Community Living. The NBACL imposes its inclusion and community cliches on all public discussions and decision making processes necessary to arrive at real, evidence based solutions to the challenges facing the most severely affected by intellectual and developmental disorders. 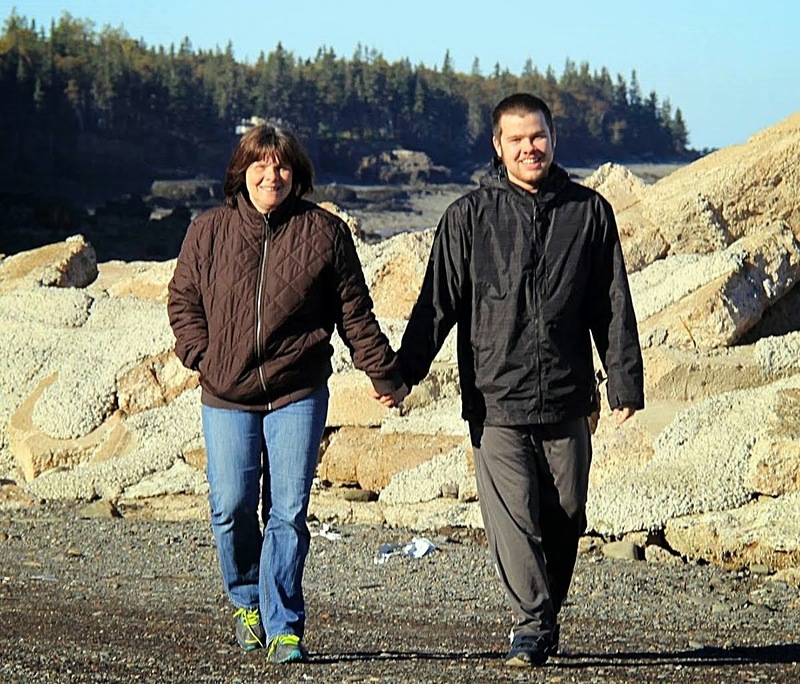 People like the autistic youth who was housed temporarily on a youth prison facility, people like the autistic adults who are sent out of the province, even out of the country to facilities like Spurwink in the State of Maine, people like those living in the psychiatric hospitals do not show up in the "feel good" PR activities of NBACL. Here in NB we receive incessant lectures about "community" and "inclusion" but we don't have a modern residential care and treatment facility that could provide care for adults with severe autistic disorders. Miles Kirsh and his parents are facing a very uncertain future right now in Toronto. Where will he live? Where will he receive the care and treatment he needs? That uncertain future is very much a problem facing Conor Doherty and his parents too. Severely autistic adults in Ontario and New Brunswick all face very, very uncertain futures. Does a Canadian society that brings criminal prosecutions against parents who do not provide proper care for their children not really care about some of those children, children with severe intellectual and developmental disorders, when they become adults? As a parent I can not accept that possibility, I have to believe that Canadians care, that our elected representatives care, and that we must continue to highlight the problems faced by adults with severe autism disorders and continue to advocate for long term care solutions. We have no choice. Beautiful, fresh, early fall day today. Conor and I both felt like getting out for a walk and enjoying the fresh air and early fall colors. Conor, as usual, set the pace and Dad lagged behind doing the best I could. Conor walked briskly, ran occasionally and, when he really got going, did his run, jump, fly maneuvers. Dad ... uh walked briskly ... on occasion. This Thursday, September 20, 2012 at 12 pm AT (1 ET) I will be a guest on the CBC Radio show Maritime Noon. I will be discussing and advocating for a flexible model of inclusive education. Marlene Munn will also be interviewed on behalf of the NBACL which promotes a full, and in my opinion, extreme model of regular classroom inclusion for all students. I am not sure if persons outside Canada can access the show on the CBC web site but this is the link for Maritime Noon if you want to try and listen to the discussion at the CBC Maritime stations listed on the right side bar under "Air Times". 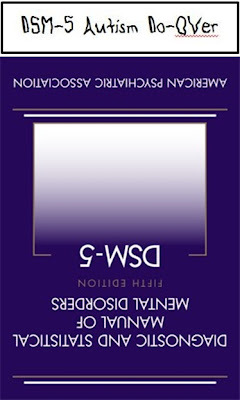 I have commented previously on the NBACL's inflexible, extreme model of inclusive education which requires all students, regardless of their abilities or disabilities, regardless of the challenges they face, regardless of the evidence and regardless of whether it is in a specific child's best interests to receive instruction in the regular classroom. I have written and spoken often of the fact that we had to ask for our 16 year old son with severe autistic disorder to be removed from the regular classroom which overwhelmed him and resulted in serious self injurious behavior. Autism, as the cliche goes, is a spectrum disorder and some autistic children thrive in the regular classroom. Some do not. For some, like my son, the regular classroom causes harm. Yet, the philosophically obsessed NBACL which acts as an unofficial division of the New Brunswick Department of Education and Early Childhood Development, as I described in Autism Education in the Era of the NBACL Inclusion Government, opposes a flexible model of education which would provide alternative learning environments for those children, like my son, whose challenges, based on the evidence, require learning in a quieter environment using different instruction methods suitable for them. Some people find it difficult to believe that the NBACL, in this day and age, contrary to evidence, contrary to common sense, and contrary to the experience and wishes of parents, who best know their own children, would still insist that every child should be educated in the regular classroom. But that is exactly what the NBACL insists upon. As the NBACL likes to say its philosophy based full Inclusive Education policy "is that simple". What is inclusive education? It is simple: children go to their community or neighbourhood school and receive instruction in a regular class setting with non-disabled peers who are the same age. NBACL Icon Gordon Porter in the Western Star (Newfoundland) article "Inclusion in the classroom simple, says educator"
Re: Should Liberal Leadership Candidates Debate? I would like to see a debate which included discussion of policies for autistic children and adults in New Brunswick. The US CDC (Centers for Disease Control) has recently revised its estimates of autism disorder prevalence ... it now stands at 1 in 88 persons as being diagnosed with an autism spectrum disorder. 751,171/88 = 8535 NB'ers with autism. Here in NB gains were made under Premier Lord and Premier Graham in evidence based early intervention and education. Those gains are now being eroded ... rapidly eroded ... under the Alward government. Nothing has ever been done to provide decent residential care and treatment for severely autistic adults despite a recommendation by autism expert Dr. Paul McDonnell that the government construct an autism residential care and treament facility in Fredericton near NB's autism expertise. NB currently spends hundreds of thousands to send autistic adults to Maine for residential care and treatment. 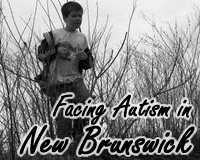 It would be very helpful if NB's Liberal leadership contenders could discuss & debate policy for NB's 8535 autistic children and adults. Father of a 16 year old autistic son. UPDATE: Conor had a great day at school today! Conor got up at 6 am today, as he has for the last 2+ months to mark down the number of days to school. He started doing this with 65 days to go and today he was very happy to mark 0 days to school! He also placed his packed bookbag and lunchbag at the front door to make sure we went to school. Conor has severe autistic disorder with "profound developmental delays". He was removed from the regular classroom, at our request, early in his education when we realized that the self inflicted bite marks were happening because of his placement in the regular classroom where he was overhwhelmed. The biting declined, and disappeared completely, once he was placed in an individual learning environment to receive his ABA based instruction. Since then adjustments have been made so that he starts his day and spends breaks with other challenged students in a resource center at the Leo Hayes High School. It is an important and valuable resource where Conor has been very well received and where he has made friends. He also socializes with other students in the halls and in a variety of settings in the school and on expeditions. He receives his primary ABA based instruction outside the mainstream classroom in a quieter, less overwhelming individualized environment. Conor's flexible model of inclusion works for him and many other students who require accommodation of their disability based challenges. The rigid ideological everyone in the classroom philosophy for learning did not work for Conor and does not work for ALL students with autism and other challenges. Some students with autism can prosper in the classroom some can't. It is necessary, in an evidence based, humane and lawful education system to look at the needs and strengths of each child and accommodate those who require accommodation. In some cases that means outside the mainstream classroom. Conor voted against the rigid inflexible model of full inclusion for all when he came home each day with bite marks on his hands. Today, once again, he voted for FLEXIBLE inclusion when he marked his board to show ZERO days to school. Conor is going back to school, flexible inclusion and all, and he is very happy. DSM5 Autism Do-Over Raises Concerns Down Under, Yeah? Concerns have been raised in Australia over the DSM-5 Autism Do-Over, the new Autism Spectrum Disorder. 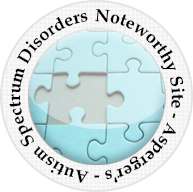 The fears echo those held by many in North America where studies have suggested a loss of autism diagnoses under the new DSM-5 diagostic criteria for autism with a possible loss of funding for autism treatment and services. "Vicki Gibbs from Autism Spectrum Australia's diagnostic service said Australian research has found a significant number of autistic children would fail to meet the new criteria. "What our study found was of the 120-odd children that we assessed, about 23 per cent of those children who would have got a diagnosis under the existing DSM 4, we would not have been able to give a diagnosis under DSM 5, just because they didn't have enough of the symptoms," the clinical psychologist said." As the parent of a 16 year old son with severe autistic disorder I learned long ago that unanticipated changes can have immediate repercussions for my son. Meltdowns have been prompted by unanticipated and, sometimes, unnecessary changes in my son's routines and expectations. Change itself can be very disruptive. It does not appear to be a lesson learned by the autism experts on the DSM5 committees ... yeah?